In the Bible, a rock crystal was likely used as the last stone in the second row of the High Priest's breastplate (Exodus 28:18). It is also likely the third stone that adorned a newly created Lucifer (Ezekiel 28:13). The Hebrew word for this gem is yahalom (Strong's Concordance #H3095), which comes from a root word which means, "to strike." Strong's translates yahalom as "diamond" while the BDB Bible lexicon states it was a precious stone known for being hard. Seven out of ten Bible translations used in this series render this word as "diamond," with the NCV and NIV translations rendering it as "emerald" and the NLT calling it a "white moonstone." Although diamonds seem to be the correct translation of yahalom for the priest's breastplate stone, there are other Bible authorities that call this rendering into question. "It was doubtless some hard stone; for the original Hebrew term implies striking. But it is questionable whether, in the early ages of the world, the art or cutting and engraving the diamond was understood" (People's Dictionary of the Bible). Does the star of David symbolize evil? "There is no trace of evidence that the ancients ever acquired the skill to engrave on the diamond, or even that they were acquainted with the stone. The 'diamond' here may possibly be some variety of chalcedony, or (perhaps) rock crystal" (Barnes' Notes on the Bible). The book "Gemstones in the Breastplate" (pages 21 to 23) further makes the case that instead of diamonds a gem known as rock crystal (also referred to as clear Quartz crystal) was used in the breastplate. 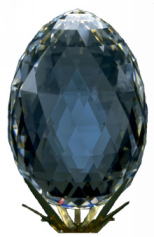 This stone, appearing clear like diamonds and sometimes used to imitate them, has a Mohs scale hardness value of seven. This would make them easier to engrave upon than a diamond. Rock Crystals were believed, if put in a person's hand, to be able to waken them from sleep. This gemstone was also thought to have the power, if placed on a person's stomach, to waken them from sleepwalking. An epileptic seizure, however, would ensue if the stone were placed too long against a person. Spheres of rock crystal (commonly called a crystal ball) were used, by those who indulged in the black arts, to pretend to be able to foretell the future. Cherokee Indians in the United States believed the stone had divination powers and could aid them in hunting (Curious Lore of Precious Stones, page 10, 76, 180 and 254). What exactly is black magic? What does Proverbs teach about health?